Wishing you the best with the surgery! Hope it's nothing serious! Happy Monday! Enjoy those cookies! Prayers and good thoughts for your upcoming surgery. God is good and will carry you through! Praying that your surgery goes well! i do hope your surgery is minor and all is well as soon as possible!!! I'll be thinking and praying for you and your surgery Leslie!! Keep your chin up! I'm so sorry to hear about your recent health problems, but so thankful that you're able to rely on your hubby. Congrats on the new home-based position! Sorry to hear about your having to have surgery. Thank goodness you have such a sweet husband to take good care of you. I've been trying to find an office chair myself... It's tough to find something chic on the cheap, though. hoping your surgery is nothing serious!! thinking of you! Hope everything is ok...and that the creature vacates your dryer...now! Have some cookies and relax. LOVE the keep calm sign. 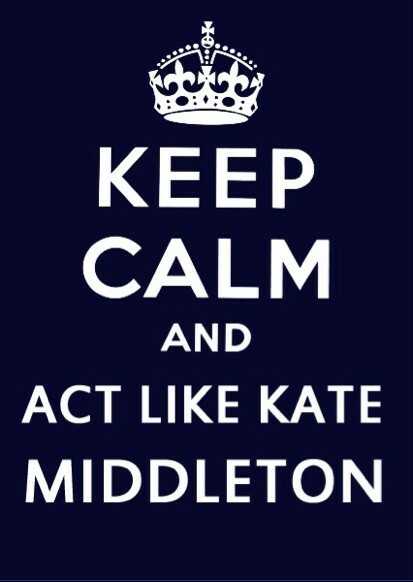 I love all of them, and especially admire Kate Middleton, so it's perfect. Hope you have a great week! Everything will go so smoothly with your surgery! I sure hope you ate at LEAST one cookie- and can't wait to see the chair! Hope your surgery goes well! I am also very much over the presidential elections! Good luck with everything girl! I am glad you have such a great hubby. Sounds like the best! :) Keep us posted and know we are definitely praying for you! Sorry about the "pet." Maybe he really isn't THAT big...? I hate campaigns too! So over them! I hope the surgery goes great! Hmmm...hope your new 'pet' leaves peacefully and easily, are there any humane animal relocaters in your area? Working from home is very much my ideal, was this a part of the job that you sought out? Congratulations on that! We had a BIRD that got in our dryer vent! It finally flew out and was just as scared as we were! haha! I hope you get to the bottom of the critter sitch soon! And home based jobbidy?! Did I miss this exciting news?! Probably. I seem to catch up on every third post these days. Ready to move in with Eric so I have more Jackie-time. My roomie doesnt understand the ways of the blog. Anyhoo, Congrats! That's super exciting! I love me some sweet home alabama although my husband made a good point ... if it's called sweet home alabama why aren't the bachelor and bachelorette from AL? Well I know originally she was... but it seem silly. That being said I get the chain of events. I find it odd that this season the runner up that Tribble didn't choose wasn't chosen and Paige was... then again maybe the runner up declined. Paige is a doll - I will say that some of the dudes from the South are not painted in the best light but they really are better than those city boys they find... it's horrible and THEY are horrible. I'd take a southern boy over them any day and I'm from the city. I am sorry to hear you're having to deal with surgery. I hope you are ok!! I know we don't know each other well but I'm a great listener if you need anything holla! UGH VARMITS IN THE VENTS! We have had issues with this too in our crawl space at the house! I hate it. When winter comes all the stray cats and animals flock to our home for some reason. We have since plugged up all the crawl space holes but they still get in. Cats most likely but once there was a 'possom. Yes.. you read that right. I hope your varmit gets out of there ASAP!!! Tons of prayers to you! Wishing you luck on your surgery! Will keep you in my thoughts ! Leslie - so sorry to hear about the surgery. Praying for you, lady. Sorry to hear that you will be undergoing surgery! I hope it is nothing serious but that is great you have such a wonderful man to lean on! !